Shirlock Holmes would have spotted it sooner. It took me a while longer to work it out. I noticed that the IHRB topical solution comes in a bottle whose labels were not centered. Why was the label raised? Upon closer examination, I noticed that the lower area was sticky, so I wrapped it with a piece of tissue so that the sticky area can attract the fibres. Now we can observe that there was once a label there. It seems evident that someone had removed a label from the lower area. What was on the label that went under the main label? 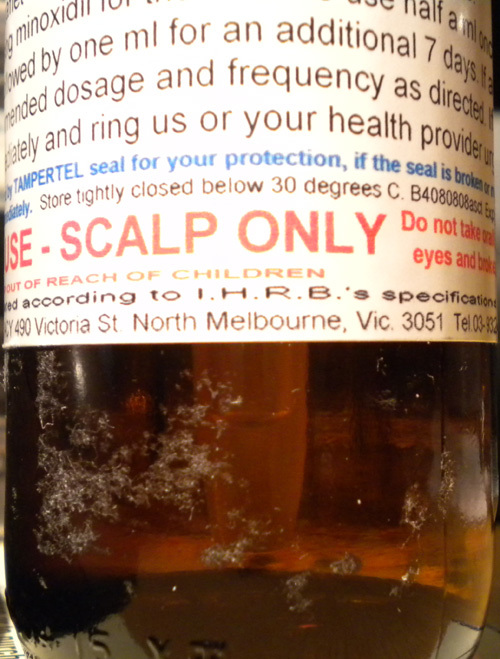 I suspect that the compounding pharmacist had placed a warning or a message on a label at the base of the bottle, and Mr Sam Cohen or a staff member at IHRB had removed it. We can only wonder if it is legal for IHRB to do this. We can see the sticky remnants of where a label had been affixed. It might have been something simple. But sadly, I have my doubts. The image below shows a bottle that contains Retin-A, and that bottle had also had a label that has been tampered with, completely peeled off. Mr Cohen does not seem to understand that one option for him is to operate ethically. It seems that every time one of his pahracists works out that he is breaking the law, and they dump him, he just moves on to another poor unsuspecting pharmacist. Since IHRB was served with a Permanent Prohibition Order by the Health Care Complaints Commission, pharmacists who choose to do business with IHRB and Mr Sam Cohen had better be ready to answer some basic questions, like how on earth are you giving stuff to an unlicensed man to sell to people, without a prescription? How can you keep selling stuff to organisations like IHRB when Mr Sam Cohen is changing the dosages, and removing labels, and omitting safety information, and re-drafting his own information sheets and not explaining the potential adverse side effects as is required by law? In this day and age, it is so easy to Google anyone’s name. I wonder how many pharmacists and business people conduct a simple Google search on the people with whom they are about to do business. Dear Mr Cohen, if you want to transact in a market, and you want to make money, you must realise this: we have many rights as humans on this planet. However, making money is not a right. Business operators have no right to make money. They must earn the right to make a profit. And you can’t earn that right until you deliver on your promise: the promise made to your profession, to your community, to your society, and to your customer. Use as directed… by whom?